A vintage Chip Moody (left) at Ch. 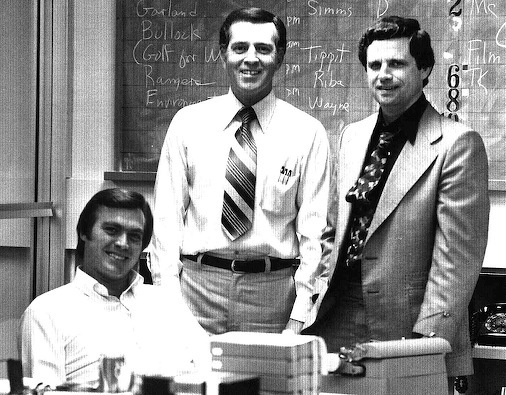 5 with fellow anchors Ward Andews and Russ Bloxom in a timeless photo from the 1970s. Note to readers: This is one of my all-time favorite articles. It captures Chip Moody at the height of his charm, but at a low point as well. Two years after its publication (Dec. 27, 1999), Moody died at age 54 after a 15-year battle with Hodgkin's Disease. At the time this was written, he still dreamed of returning to Ch. 8 to re-breathe that rarefied news anchor air. DALWORTHINGTON GARDENS, Texas -- Glory be, we're in Chip Moody's Model A 1931 Ford convertible roadster, the one with the holiday wreath affixed to the front. Sounds like fun, except the roadster has conked out and is sitting on a shoulder of Interstate 20 West on what's rapidly becoming a freezing late afternoon. Moody, wearing his "Second Chance" World War II leather bomber jacket, is tinkering under the hood, but to no avail. So the photographer who'd been sitting in the rumble seat hoofs it off to a Texaco station about a half-mile east. There he'll phone Moody's incredibly understanding wife, Vikki, who had warned him not to take the vintage vehicle onto the freeway. Hundreds of motorists whiz by before she arrives to tow the antique back home. Finally, one stops to see what's up. It takes the young man barely a moment to ask, "Hey, aren't you Chip Moody?" Pleasure to meet you, sir." Moody, who hasn't been on television since April, can't help but beam. And there you have him in a nutshell. Acting hale and hearty despite health problems that would have felled just about anyone else on the planet. Still headstrong to a fault, although insisting otherwise. Indomitable. And mighty happy to be reassured that people still recognize and remember him from days behind the anchor desk at WFAA-TV (Channel 8). He is certain those days aren't over. And given what he's overcome -- Hodgkin's disease, massive internal bleeding, intestinal blockages, the removals of his spleen, appendix, gall bladder and stomach -- it's foolish to doubt him when he says he'll be back in the saddle again. By the February "sweeps," he hopes. "I think the trend is up, and I'm probably about 15 pounds away from going back to work," says Moody, who currently weighs 140. "If I'm doing OK physically, that's one thing. But if I look too gaunt on television, it scares or worries a lot of the viewers. "That's a legitimate concern in the television business. If I can just get a little more stamina and weight, I'll be back in the starting lineup. That's where we all wanna go . . . I think I could go on the air and look fine at 155 pounds. I don't have that hollow-eyed, death camp look anymore. But at the same time, I don't have the muscle mass and body weight that I'd like to." Channel 8 general manager Kathy Clements-Hill, who visited Moody at his home last month, worries that a February return might be too soon for the 52-year-old anchor. "I hope -- oh, I hope -- he can be back," she says. "It's really up to how fast Chip recovers and how he feels and if he's healthy. The last thing I want to do is bring him back to work too early and have his health deteriorate. Our first priority is making sure he stays healthy." After losing Moody indefinitely and fellow anchor Tracy Rowlett to rival KTVT-TV (Channel 11), the ABC affiliate added Scott Sams to a 10 p.m. newscast rotation that also includes John McCaa and Gloria Campos. Moody's return is still too hypothetical for the station to decide where to put him, Clements-Hill says. "But we have so much depth in our anchor team that a rotation of four is not out of the question at all." Moody is still fighting back from the removal of his stomach in June at Baylor Medical Center. "That was a big operation," he understates. It was necessary because, in his words, "my stomach had become like a big, thin plastic bag from the grocery store that didn't empty. The best option was to get rid of an organ that just didn't work anymore." Complications prolonged the surgery to 18 hours, twice as long as doctors had estimated. "Then they kept me in a coma for a week so I didn't move around and goof up the little sutures and stitches inside of me," he says. He spent seven weeks in the hospital and is still dependent on daily in-home intravenous feeding. It takes 14 hours for a bag of white fluid -- called Total Parenteral Nutrition -- to drip 1,800 calories into his body via a tube inserted in his chest. He begins the process daily around midnight and doesn't know how long he'll have to keep it up. So far, he's been unable to gain enough weight by eating little meals every two hours. "When you're not hungry, that turns into a job," he says. "It's been a more difficult recovery than I'd hoped." Still, he greets a visitor at 2 p.m. with what seems like boundless energy. The Moodys' two rambunctious dogs, Bear and Biscuit, are with him while he shows off the Model A that later will provide a truncated joy ride. We're amazed he's still with us," says Vikki Moody. "The doctors have said that any other man would have been gone long ago. He's got an amazing amount of fortitude. I think it's made everyone else in the family stronger." Early days at Channel 5 and near the end with Channel 8. The family also includes son Trae, 24, and daughter Tiffin, 23. Moody's father, Robert Phelps Moody, lives just three miles to the north. They're both pilots -- and cancer survivors. It was 1986 when Chip Moody first discovered a lump in his throat that had nothing to do with sentiment. 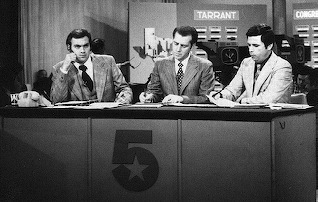 He was anchoring in Houston after tours at two Dallas stations -- KXAS-TV (Channel 5) and KDFW-TV (Channel 4). The diagnosis was Hodgkin's disease. Before the year ended, Chip, his father and mother, who's since died, all were undergoing cancer treatments in Houston. 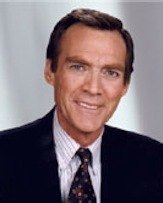 By September 1987, after a 16-month recovery period, Chip returned to Dallas to join Channel 8's news team. He had been warned by doctors, however, that the cancer treatments "might give me some trouble down the road with some of my other organs. But they told me that if I didn't take the radiation, I wasn't gonna get down the road." His intestinal problems began in the early 1990s and have put him in and out of hospitals ever since. "I guess I've been blessed with a pretty good fighter-pilot mentality," says Moody, whose passions are plains, trains and automobiles. "I do keep kind of bouncing back. After about four of these operations, I'm getting a little bit weary of it. But I can still laugh. I don't party like I used to, but I've got a pretty good outlook on life." His vigor is often what gets him into trouble. The three-acre Moody spread, just west of Arlington, has plenty of trees to trim and a sizable lawn to mow. And it almost kills him inside to let someone else do this dirty work. "It's easy to get lazy and sit around. And I just hate it," he says. "It's not me. I get mad at myself. But at the same time I have to listen to Vikki and my doctors, who say I'm doing the correct thing. If I try to push it too hard, nobody wins. I can't expect to just jump back into things, so I'm pulling the throttle back a little bit. But it's not easy for me to do!" No, it 's not. Moody's left arm still has some angry-looking scabs. They aren't from various medical treatments or malnutrition, he assures. "I kind of ripped myself up on a couple of tree branches," he says. "I got a new electric saw and I just went crazy one day." He laughs, and it's impossible not to join him. But is he deluding himself? Should he give up on the idea of anchoring again? Or is that what sustains him? "At 52, I'm awfully young to think about retiring," he says. "And hopefully, people in the viewing audience think that maybe I'm only about 46. But yeah, that's keeping me going right now. Although it" -- his voice falters -- "has crossed my mind a couple of times that maybe for longevity's sake I oughta hang it up as an anchor. I think I would have to be mired in a really chronic lack-of-weight situation for that to be a serious consideration, though. On my worst days, I haven't even had the steam to get out of bed." But he's encouraged by what he sees as slow, steady progress. And buoyed by thousands of get-well cards and letters of encouragement. "If I had 5 pounds for everybody who offered me 10 pounds of their weight, I'd be like the Michelin man," he says. "He's just got a longer road to hoe this time," says Vikki. "But he's Chip. That's the only way to explain it. He's a unique individual and he just doesn't believe that he's as sick as he is, or that it's something that can't be overcome." A half-hour later he's in the Model A, cruising, then chugging, before finally pooping out. Chip Moody wants the same outcome for himself, only in reverse order. And his full-blooded heart has never stopped telling him that this is truly meant to be. "I'm building up steam," he says. "I'm waiting for the engine to get up to speed."